To say we’re a football family is putting it lightly. With coaches, players, and avid fans in the family, every child learns how to spiral a football shortly after they know how to walk. We also have our team allegiances, too, and whenever we get the chance it’s fun to get together with family and friends to watch the game and eat some great food. 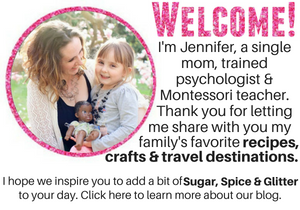 It’s an opportunity to connect and enjoy each other’s company without the hubbub of the holidays or the pressure of a more formal get-together. On family football nights, I like to keep the food straightforward and simple, but always delicious. I want to spend my time enjoying conversation with friends and family – not hunkered down in the kitchen, toiling away over the food. 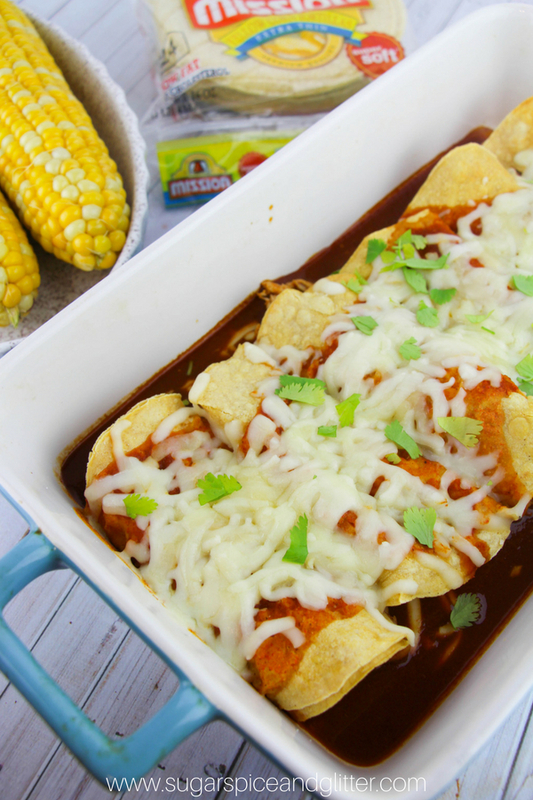 These Chipotle Chicken Enchiladas made with Mission® Super Soft Corn Tortillas are a staple in our football nights. 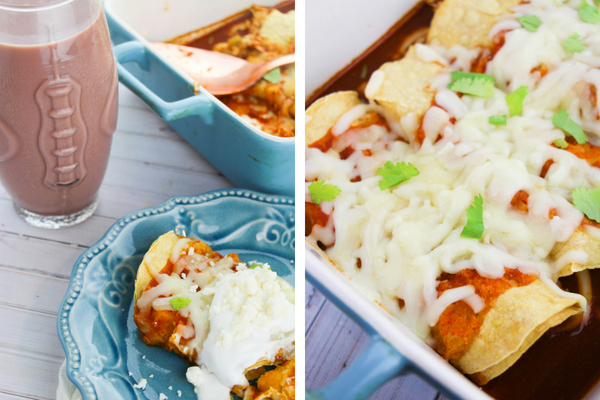 Everyone loves them, they are simple to make, and the recipe makes two large casserole dishes worth of enchiladas with minimal effort, so there’s plenty to share. 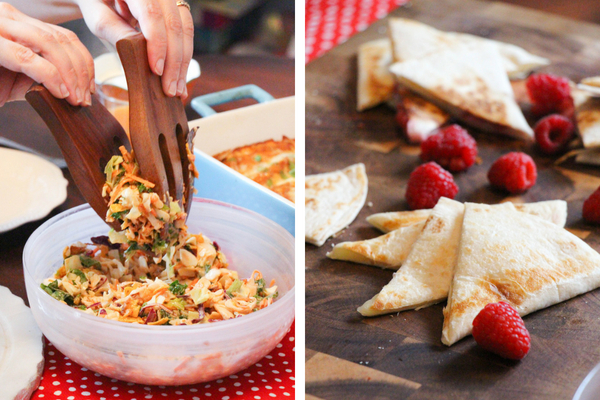 If you have a smaller gathering, they also make great leftovers (but we rarely have any of those). Mission tortillas are soft and made with the highest quality corn flour available. 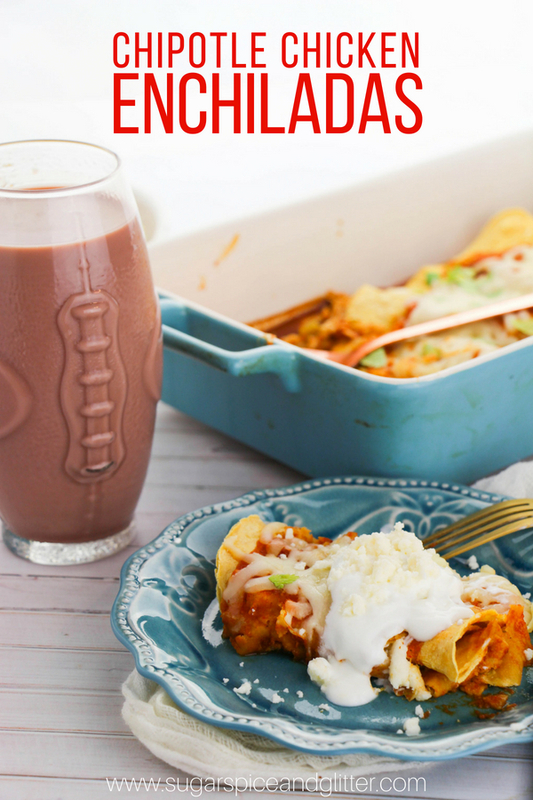 They are perfect for any dish including this Chipotle Chicken Enchiladas recipe. With low-fat, no lard, and no cholesterol, you can dive in without any guilt. 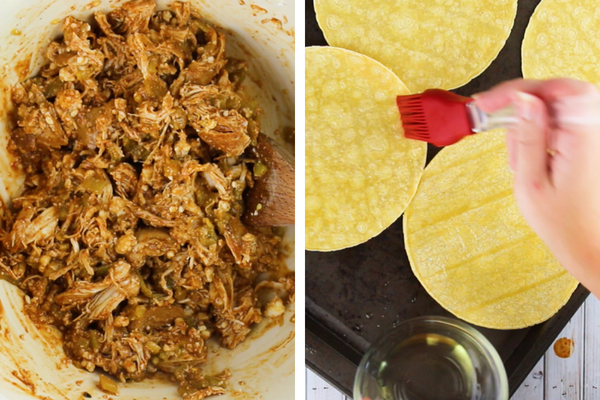 The tortillas are also gluten-free, so rest assured this will please just about anyone. 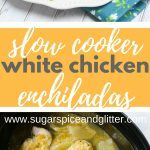 I’ve spent years perfecting this recipe with little flavor tweaks and tricks, like warming the Mission tortillas in the oven before filling and rolling the enchiladas to help them be extra pliable and less prone to cracking under the weight of the filling. 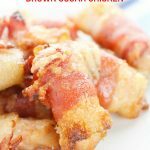 After all of the effort it took to develop this recipe, I love serving up this recipe to friends and family – and I’m equally excited to be sharing it with you today! While I strictly use Mission Soft Corn Tortillas for enchiladas, I did put their flour tortillas to good use by incorporating them in raspberry-cheese quesadillas for the kids and baking them and tossing into a crunchy Southwestern salad. We rounded out the menu with fresh corn on the cob and football-shaped snack cakes for dessert. Oh, and I picked up some cute football-shaped glasses for the kids to drink chocolate milk out of! Everything was simple, easy and incredibly satisfying. I just put everything out on the table family-style and let everyone self-serve. I find this is a great way to get kids to be curious about some of the food that is on the table and they are more likely to request to try it versus if the food is all kept in the kitchen. 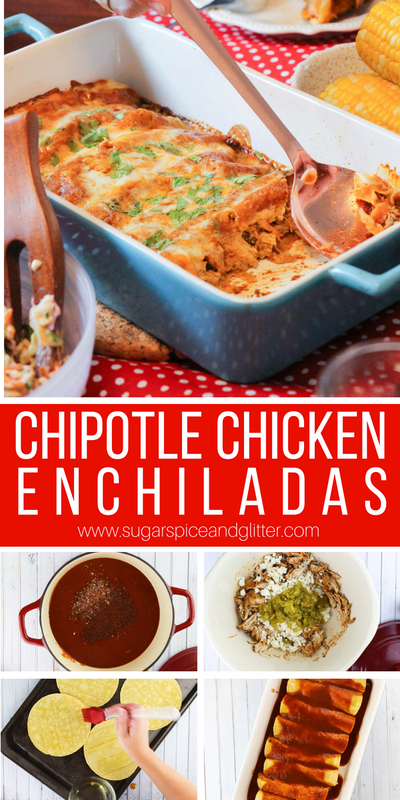 This Chipotle Chicken Enchilada recipe is a slightly spicier and smokier take on a classic chicken enchilada. I love the depth of flavor added with just a couple new ingredients, and clearly my guests do too, because they never leave me any leftovers! 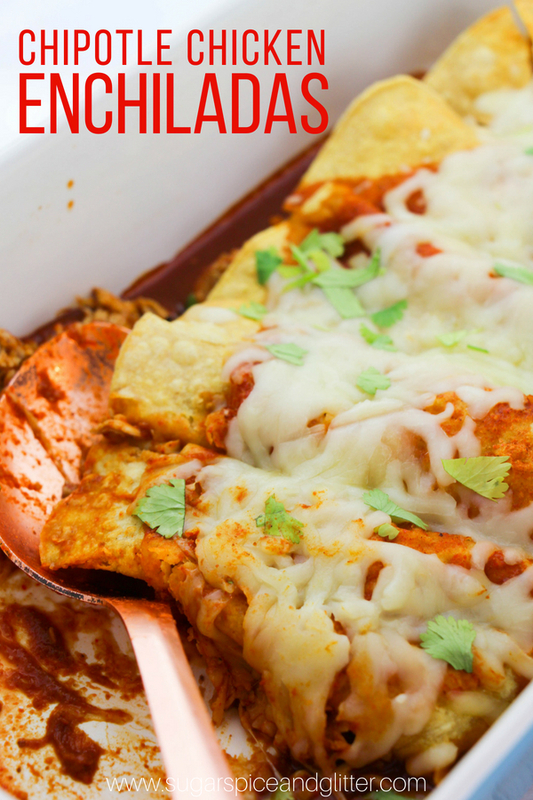 If you’ve never had enchiladas, they are basically a soft chicken taco that has been baked in a seasoned tomato sauce and topped with cheese, but that simple explanation does no justice to conveying just how delicious they are. 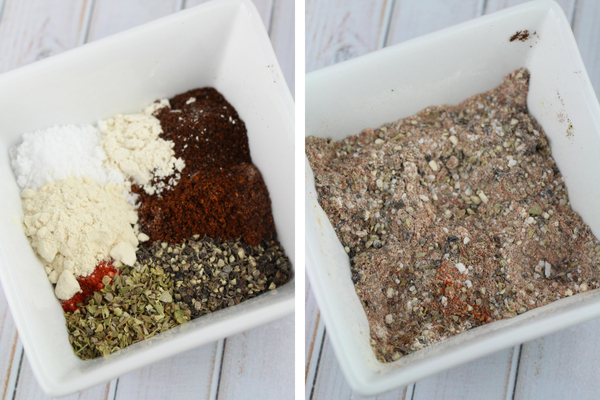 Making this adobo seasoning once makes enough for 18 batches of this enchiladas recipe. It’s also delicious in dips and soups. I keep all of my homemade spice blends in small mason jars near the stove and they get used daily. 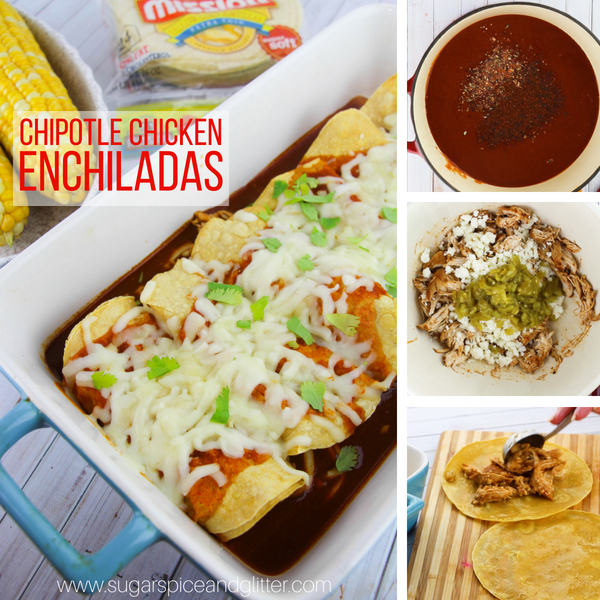 Some people like their enchiladas super saucy and soft and some like to have a bit of the crispy baked corn tortilla peeking through, so I made each tray slightly different to allow guests to have their enchiladas exactly the way they like them. 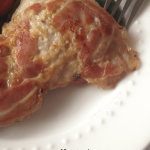 The whole point of this recipe is to entertain and feed your family a delicious meal with ease. It’s also naturally gluten-free, which is great if you have guests with that dietary need or preference. 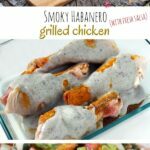 Tip: once the chicken is fully cooked, I encourage you to taste this recipe often through the cooking process and adjust the seasoning to your liking. 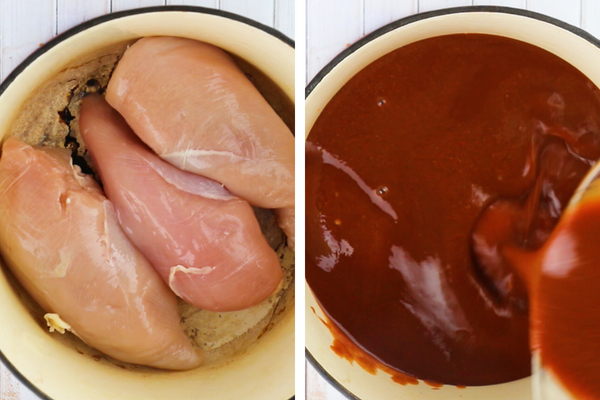 Place chicken in a stockpot or dutch oven. Add the enchilada sauce, adobo seasoning and chipotle pepper. Heat over medium-low heat for 20-30 minutes, stirring occasionally, until the chicken reaches an internal temperature of 165F and shreds easily when pierced with a fork. 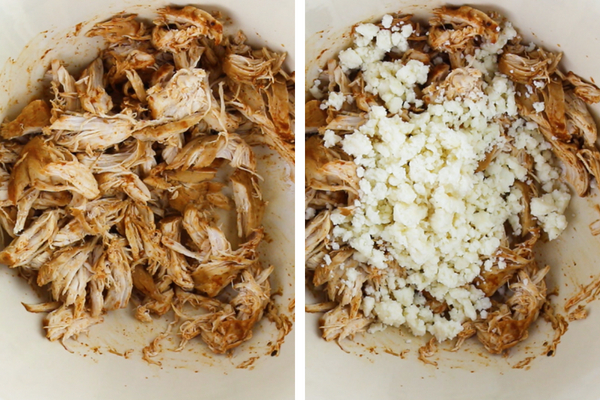 To shred the chicken, you can use two forks or an electric mixer. For safety (no hot splattering sauce), remove the chicken from the stockpot and place in a large bowl for the shredding process. 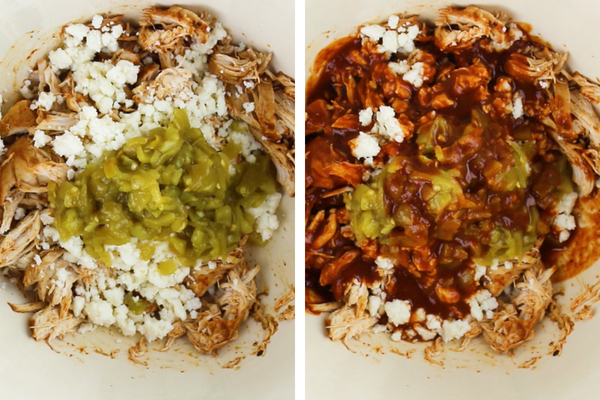 Once the chicken is shredded, combine with 1/2 cup of the enchilada sauce it was cooked in, queso fresco, green chiles and chipotle sauce. Season with more adobo and chipotle pepper, if desired. 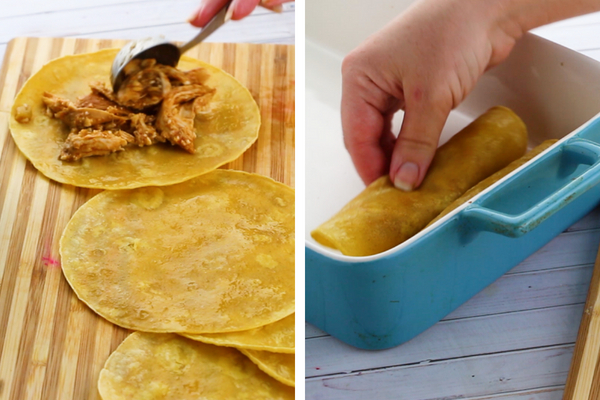 Place the Mission Super Soft Corn Tortillas on a baking sheet and lightly coat (or spray) with oil. Working quickly, place the warmed tortillas on a clean surface and add 2 tablespoons of the enchilada filling to each. Roll and place in the two baking dishes. 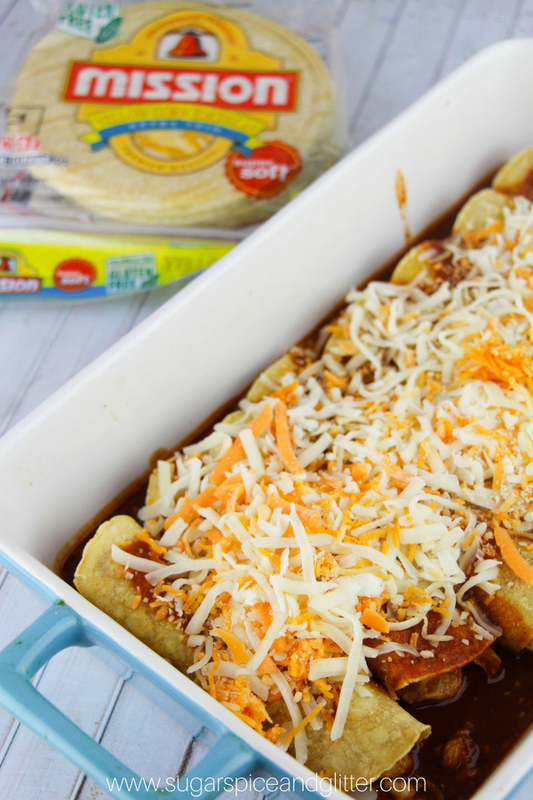 Each dish should have approximately 8 rolled enchiladas. 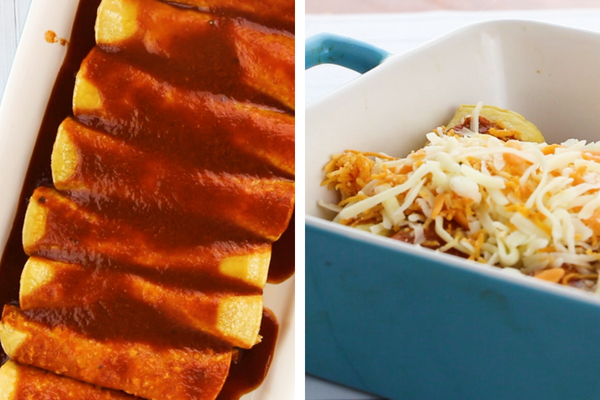 Pour 1/2 to 1 cup of enchilada sauce over each baking dish full of enchiladas and sprinkle on two cups of cheese per dish. Cover each dish with tin foil. 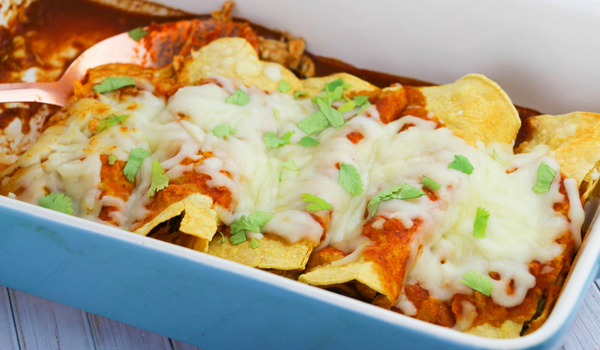 Increase the oven temperature to 450F and when fully heated, bake the enchiladas for 10 minutes, then remove the tinfoil and bake for an additional 3 minutes to melt the cheese. 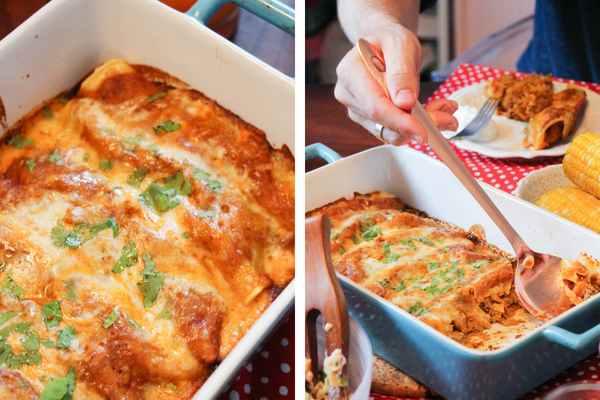 This easy chicken enchilada recipe is a delicious party recipe or a fun family night option that can be prepared in advance. Since the recipe makes 16 enchiladas, it’s also great for making one to enjoy this week and freezing one for future use. Mission Super Soft Corn Tortillas are available nationwide at stores in the bread or tortilla aisle! 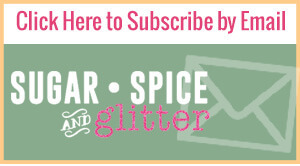 Check out the store locator at Mission Super Soft and find more recipes there!